Terrinoth is a land filled with adventure. But what is thrilling adventure without dangerous adversaries to stand against your mighty heroes? And what is an adventure without strange new locations to explore? Mennara is filled with fascinating characters and places, all of which are detailed in Realms of Terrinoth, a new fantasy sourcebook for the Genesys Roleplaying System. 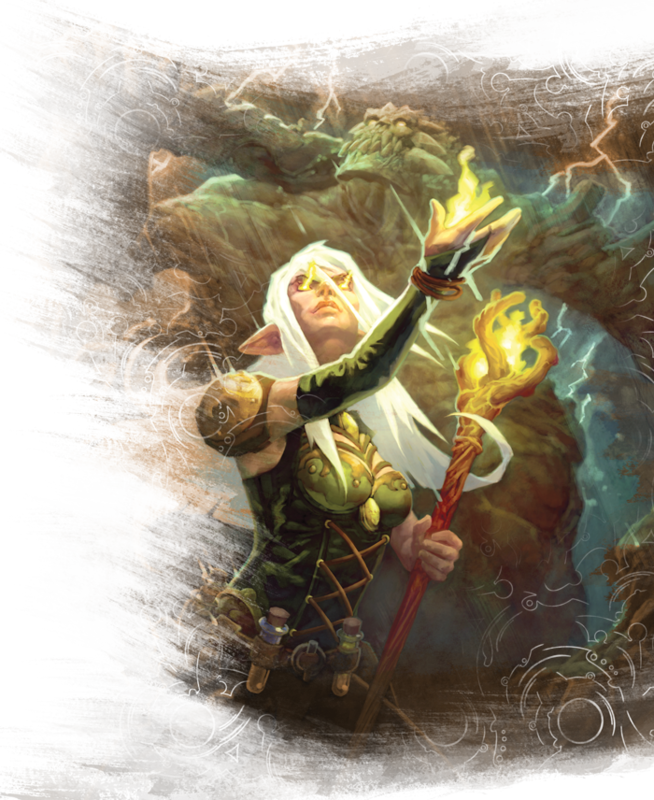 Join us today as we preview the unique regions found in Realms of Terrinoth. Explore the ancient Aymhelin, the terrifying mistlands, the hidden Dunwarr Mountains, and more as you explore the world of Mennara. Within the description of these regions in Realms of Terrinoth, you'll not only find mechanical information for Game Masters, but tidbits to spark your imagination, helping you develop your own unique fantasy setting based on the varied landscapes of Mennara. Pity those who find themselves in the domain of Waiqar the Undying. Those who dare travel beyond Greyhaven find themselves in a shrouded, ever-shifting landscape where warming light seldom reaches the ground. Bounded by fetid marshes on the west and the Dunwarr Mountains to the north, these are the cursed lands of the thirteenth baron of Terrinoth, he whose seat at Archaut has remained empty for hundreds of generations. This region is filled with volcanic crags and sprawling marshlands that bubble and boil, expelling murderous gases and trapping foolish adventurers in black muck for eternity. The dank, cold lands of the Thirteenth Barony contain terrible monsters, all the worse as many of them were once Human. Thirst for power, jealousy over status, desire for revenge, and other vices have corrupted once-noble leaders into deathless things that exist only to consume all that lives. This includes the terrifying Death Knights, Waiqar’s hatred and maliciousness made manifest. Made from the dust of his most loyal original soldiers, few live to tell the tale of coming across a Death Knight in the dreaded Mistlands. Riding vampiric steeds, there is nowhere to run and nowhere to hide from the pursuit of a Death Knight. 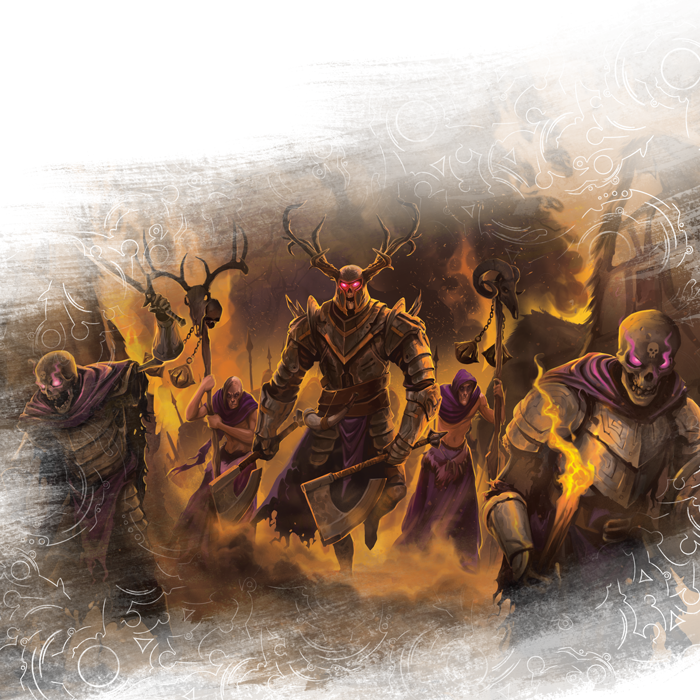 Now, these terrifying, twisted, corrupted warriors of Waiqar can join your game of Realms of Terrinoth, and you can get a taste of their power below. The stat line for Waiqar's dreaded Death Knights show but a taste of their true power, purchase Realms of Terrinoth for a look at their frightening talents. To the uninitiated, the Aymhelin may look like an undeveloped, sparsely populated woodland region of Mennara. But a deeper examination reveals something spectacular. Each gleaming spire, each brilliantly sparkling stone pathway, each dense copse of stately trees, each beautifully manicured acre of prairie, and each crystal-clear pond and lake has been carefully harmonized to bring nature and civilization into near-perfect accord. It allows the Elves who dwell in the cities to commune with nature, those who live in the verdant forest townships to easily partake in the benefits of modern civilization, and the entire nation to rally together under threat of foreign or supernatural invaders. The inhabitants of the Aymhelin have a deeper connection than most to the strange magic of Mennara. Storm Sorceresses can take control of the very air around them, manipulating their environment with frightening skill to call forth blinding blizzards, gale-force winds, and more. To face down a Storm Sorceress is to engage your very environment in battle, and your heroes best be prepared. Though they mostly keep to the deepest part of the Aymhelin, occasionally they find themselves in the outside world, searching for valuable resources to further their magic. A preview of the power of the Storm Sorceress. Bleak and foreboding, the Dunwarr Mountains are a collection of blizzard-pounded peaks, sharp ridges of gray slate, and gnarled clusters of twisted evergreen trees. Between the snowy crags lie high meadows, fed by swift-flowing, icy brooks. Apparently home to nothing beyond the occasional goat and jackrabbit, the Dunwarr range is the last place one would expect to find an empire. But deep within these mountains resides a forgotten ancient civilization of dwarves. These Dunwarr Dwarves are a fierce, noble people and few exemplify this like the Dwarven Dragon Hunter. Trained in the ancient art of Dragon Hunting, these warriors make pilgrimage to areas where these feral beasts of legend have been sighted and look to eradicate them, recruiting any adventurers they find along the way. To refuse will lead to a barrage of insults, and at worse, a physical confrontation. Should your heroes face down a Dwarven Dragon Hunter, they face a foe trained for life to take down the most fearsome creatures Mennara has ever seen. Of course, the heroes may also choose to join a Dragon Hunter in their quest, seeking the thrill of taking on a fearsome creature. 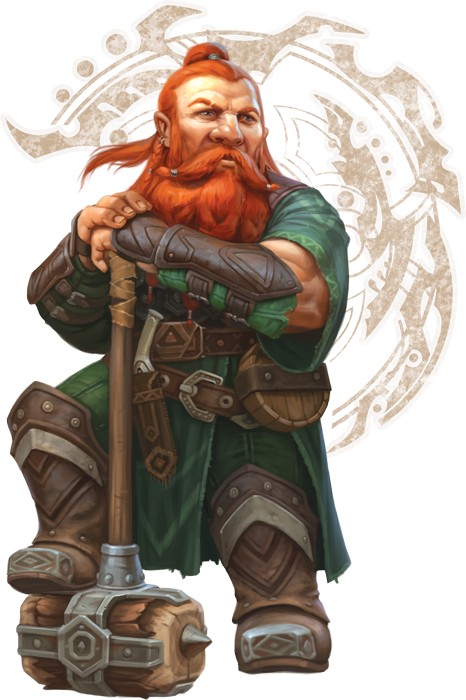 The Dwarven Dragon Hunter is trained in ancient arts, which is reflected in their skills. This is but a taste of the world of Mennara. Every region offers new characters, environments, and adventures for your hero. The Mistlands, Aymhelin, and Dunwarr Mountains hold many secrets, and new allies, enemies, and more await. Lead your heroes into the world of Mennara in Realms of Terrinoth. 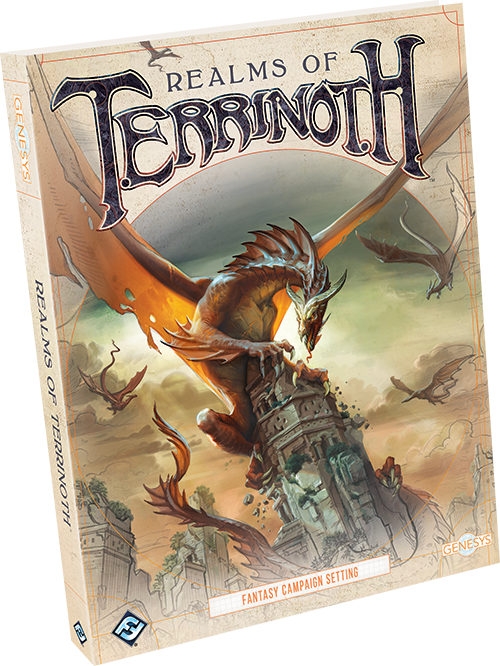 Dive into the world of Mennara with Realms of Terrinoth (GNS03), available Thursday, April 19th from your local retailer or our website!